1. Preheat the oven to 180°C, gas mark 4. Halve and stone the peaches or nectarines, then place in a shallow ovenproof dish, cut side up in one layer. Set aside the orange zest, then pour the juice over the fruit. Add a knob of butter to each, then sprinkle with the caster sugar. Bake uncovered for 10 minutes. 2. Meanwhile, blitz the pistachios until fairly fine but with a little texture in a mini processor. 3. Put the egg white and icing sugar in a heatproof bowl and set over a pan of simmering water. Whisk with a hand-held electric whisk for 3-4 minutes until the meringue forms soft peaks. Remove from the heat and whisk for a further 1 minute. 4. Fold in the orange zest, pistachios and orange flower water if using. 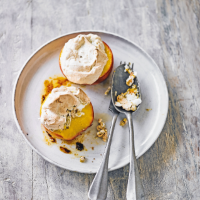 Spoon the meringue onto each peach and return to the oven for a further 8-10 minutes until the meringue is golden. Serve warm or at room temperature on the same day.